In Russian cities, most places offer a public Wi-Fi connection. Still, there is a long way to go before a wireless connection can be provided throughout the entire country. Russia offers public Wi-Fi to citizens and visitors in the majority of public spaces, particularly in main cities like Moscow and St. Petersburg. Moscow has the highest percentage of hotspots (61%) across the country, offering open networks in subways, airports, train stations, hotels, restaurants, and cafés. 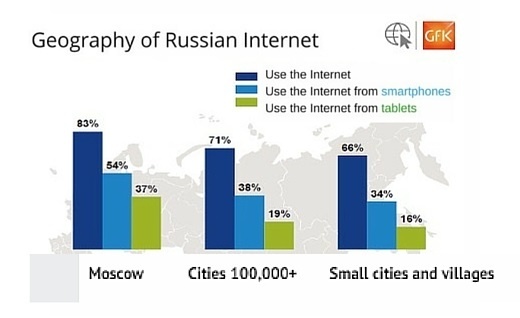 According to the GFK survey Russian population prefers using smartphones over tablets. Furthermore, the locations in Russia with the largest percentage of internet users is Moscow (83%), followed by cities with more than 100,000 residents (71%), and lastly small towns and villages with (66%). 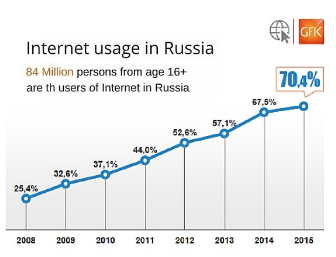 According to the GFK survey of 2015, internet penetration increased to 70.4% and there are now approximately 84 million internet users in Russia aged 16 and up. That is an additional 4 million users than the previous year. In accordance with the RF Government Decree №758 (31 July 2014) and Decree №801 (August 12, 2014), Wi-Fi users must authenticate themselves by SMS verification or by providing a phone number in order to access a public network. Alternatively, users can login by providing a name and a surname to an operator, verified either by the Unified portal of public services (EPGU) or the ID. These methods serve to identify and authenticate Wi-Fi users valid while creating a detailed client database. As a result of the Wi-Fi in Public Spaces Act of 2016, the Russian Code of Administrative Violations establishes penalties for not authenticating users while using public Wi-Fi. Penalties may vary from 5 to 200 000 Russian rubles for the first violation, and up to 300 000 rubles in case of a repeated violation. Tanaza’s simple and effective verification system guarantees authentication of all public Wi-Fi users, our software is integrated with an SMS gateway that automatically sends a text message when a user submits their mobile number. The Tanaza built-in splash page features phone based authentication (with SMS verification) and is in compliance with the Russian law.